Another two games from the SEGA Genesis (Mega Drive) classic games made it to the OnLive PlayPack. The games are Ecco: The Tides of Time and Sword of Vermilion. This brings the PlayPack to 183 games and counting. Ecco: The Tides of Time is an action adventure game classic published by SEGA and developed by Novotrade International. The Tides of Time was the direct sequel to the original Ecco the Dolphin, which is already a part of the OnLive PlayPack. The Vortex, the nearly invincible, secret, yet supremely dangerous enemy, now seems so far away. It's only been a short time since this monster tore Ecco's family from Home Bay. Then Ecco braved the unknown waters to find and defeat this menace that fed on the creatures of the sea. The Vortex Queen, though weakened, was not destroyed. She followed Ecco from her hive in deep space back to this new, nourishing planet. Now, plunging into the warm waters of Earth, she seeks out a deep chasm and sinks into the abyss, where she feeds upon the Earth as she spawns streams of Vortex young. Her feeding builds in strength, creating a downward current against which small fish struggle in vain. She is creating a new Vortex race, and her presence on Earth bodes doom for all its creatures! Ecco must rid the world of this engulfing evil. Even as he tumbles in the waves, the future is unfolding. But must it be a dark future ruled by the Vortex and - lifeless, miserable and cold? Does Earth stand a chance? Ecco must stop the Vortex! He is "the stone that splits the stream of time." He now faces his most dangerous quest yet. For it is not just his dolphin pod at stake, but the Earth and all living beings! You can play the free demo of Ecco: The Tides of Time for the US powered by OnLive. You can play the free demo of Ecco: The Tides of Time for the UK powered by OnLive. 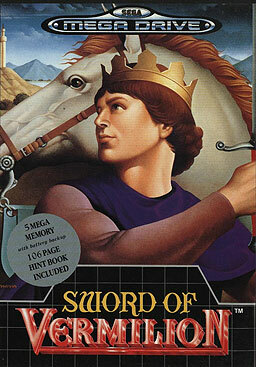 Sword of Vermilion is a role-playing video game classic published and developed by SEGA. To take revenge against Tsarkon over his father's death, the prince must collect the eight Rings of Good hidden throughout the land. Out-hack and out-smart Tsarkon's minions while collecting the hidden Rings until you reach the final bastion where Tsarkon waits. Defeat Tsarkon and banish evil from the world. You can play the free demo of Sword of Vermilion for the US powered by OnLive. You can play the free demo of Sword of Vermilion for the UK powered by OnLive.